The fifth installment of the annual musical event ‘Joy Bangla Concert’ will be held at the Army Stadium in the city today, reports BSS. 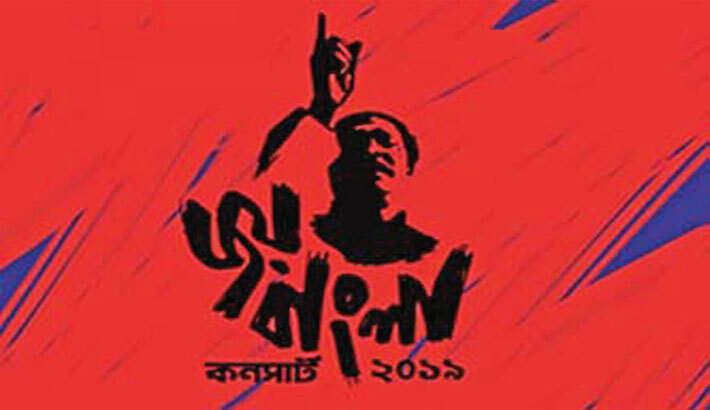 Young Bangla is organising the musical soiree to pay homage to the Father of the Nation, Bangabandhu Sheikh Mujibur Rahman's historic speech of March 7, 1971. Under the supervision of Centre for Research and Information (CRI), Young Bangla, one of the leading youth networks of Bangladesh, every year hosts the mega event to revive Liberation War spirit among youths. At the concert, leading musical bands perform one song each from the list of patriotic songs which were played from the Shadhin Bangla Betar Kendra during liberation war. “The Young Bangla has been organising the concert every year since 2015. The celebration has now become more significant as the UNESCO has recognised the landmark speech of Bangabandhu as a world documentary heritage on October 30, 2017,” CRI Associate Coordinator Engineer Tonmoy Ahmed told. He said leading bands Artcell, Chirkutt, Lalon, Arbovirus, Shunno, Nemesis, Cryptic Fate and Bay of Bengal will perform in the concert to mesmerise the fans with rock music. The entry to the mega event at the Army Stadium is totally free this year as the spectators just have to complete registration, Ahmed added. He said a large number of fans especially youths have already registered to join the concert this year which is going to be one of the best one of its kind. In last three years, around 60,000 youths, altogether, enjoyed the concert at the venue while 90,000 watched on live-streaming on different social media sites and various organisations’ websites and millions viewed on prominent TV channels. Hundreds of youths imbued with Liberation War spirit are expected to assemble at the stadium to recall the day and celebrate independence with the Bangla rock music.